Featured Image: Occupy Wall Street protesters. CREDIT: David Shankbone. (Public-Domain). The Partnership for Civil Justice Fund has obtained documents that prove OWS protesters encamped in Terry Schrunk Plaza in Portland, Oregon, were evicted for political and business reasons – not for the reasons the city stated, which were health and safety concerns. 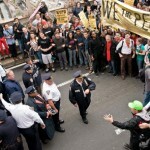 The documents also shed light on police activity in Boston and across the nation in terms of the OWS movement in general. The Resident (aka Lori Harfenist) talks about the issue.